Anne-Laure Bondoux has received numerous literary prizes in her native France. 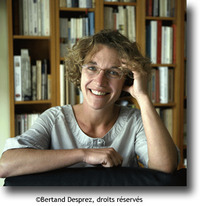 Among her previous books published by Delacorte Press is The Killer’s Tears, which received the prestigious Prix Sorcières in France and was a Mildred L. Batchelder Honor Book in the United States. YA BOOK FOR 2ND QTR 2011. FEATURING KWESI'S 10 FAVORITES. Is this you? Let us know. If not, help out and invite Anne-Laure to Goodreads.